You’ve seen the headlines: Parmesan cheese made from sawdust. Lobster rolls containing no lobster at all. Extra virgin olive oil that isn’t. Fake foods are in our supermarkets, our restaurants, and our kitchen cabinets. Award-winning food journalist and travel writer Larry Olmsted exposes the pervasive and dangerous fraud perpetrated on unsuspecting Americans. 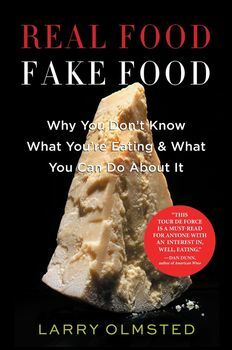 Real Food/Fake Food brings readers into the unregulated food industry, revealing the alarming truth: what we think we’re eating is not what we’re really eating. Olmsted examines how this shocking deception extends from high-end foods like olive oil, wine, and Kobe beef to everyday staples such as coffee, honey, juice, and cheese. It’s a massive bait and switch where counterfeiting is rampant and where the consumer ultimately pays the price. But Olmsted does more than show us what foods to avoid. A bona fide gourmand, he travels to the sources of the real stuff, to help us recognise what to look for, eat, and enjoy. Genuine Parmigiano-Reggiano from Italy, fresh-caught grouper from Florida, authentic port from Portugal. Real foods that are grown, raised, produced, and prepared with care by masters of their craft. Part cautionary tale, part culinary crusade, Real Food/Fake Food is addictively readable, mouth-wateringly enjoyable, and utterly relevant. Larry Olmsted convinces us why real food matters. The eye opening investigation that reveals why American consumers are unwittingly buying and eating foods that are not what we think they are, and how - for the sake of our health, well-being, and wallets we can protect ourselves.